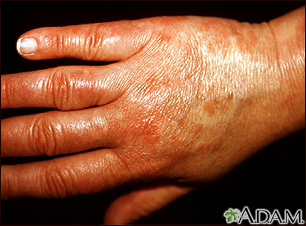 Hypersensitivity vasculitis is an extreme reaction to a drug, infection, or foreign substance. It leads to inflammation and damage to blood vessels, mainly in the skin. The term is not used much currently because more specific names are considered more precise. It usually affects people older than age 16. Often, the cause of the problem cannot be found even with a careful study of medical history. 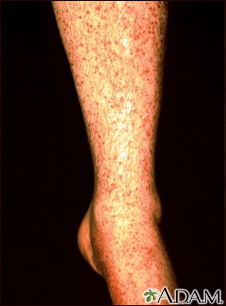 Hypersensitivity vasculitis may look like systemic, necrotizing vasculitis, which can affect blood vessels throughout the body and not just in the skin. 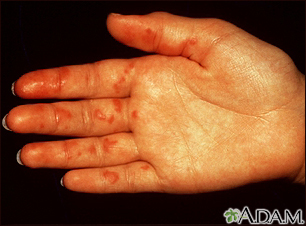 In children, it can look like Henoch-Schonlein purpura. The health care provider will base the diagnosis on symptoms. The provider will review any medicines or drugs you have taken and recent infections. You will be asked about cough, fever, or chest pain. A complete physical exam will be done. Skin biopsy shows inflammation of the small blood vessels. The goal of treatment is to reduce inflammation. Your provider may prescribe aspirin, nonsteroidal anti-inflammatory drugs (NSAIDs), or corticosteroids to reduce inflammation of the blood vessels. (DO NOT give aspirin to children except as advised by your provider). Your provider will tell you to stop taking medicines that could be causing this condition. Hypersensitivity vasculitis most often goes away over time. The condition may come back in some people. People with ongoing vasculitis should be checked for systemic vasculitis. Call your provider if you have symptoms of hypersensitivity vasculitis. DO NOT take medicines which have caused an allergic reaction in the past. Habif TP. Hypersensitivity syndromes and vasculitis. In: Habif TP, ed. Clinical Dermatology. 6th ed. Philadelphia, PA: Elsevier; 2016:chap 18. Inflammation of the blood vessels (vasculitis) may be caused when antibodies that have attached to antigens in the blood (immune complexes), attach to the blood vessel walls. These purplish spots can be felt in the skin. They do not turn white (blanch) when pressed. As the condition progresses, they may become larger and more bruise-like (ecchymotic), and some may develop central ulceration or necrosis (tissue death). These red (erythematous), hive-like (urticarial) spots (plaques) are caused by inflammation of the blood vessels (urticarial vasculitis) and do not change over a 24-hour period. They may or my not turn white (blanch) with pressure.